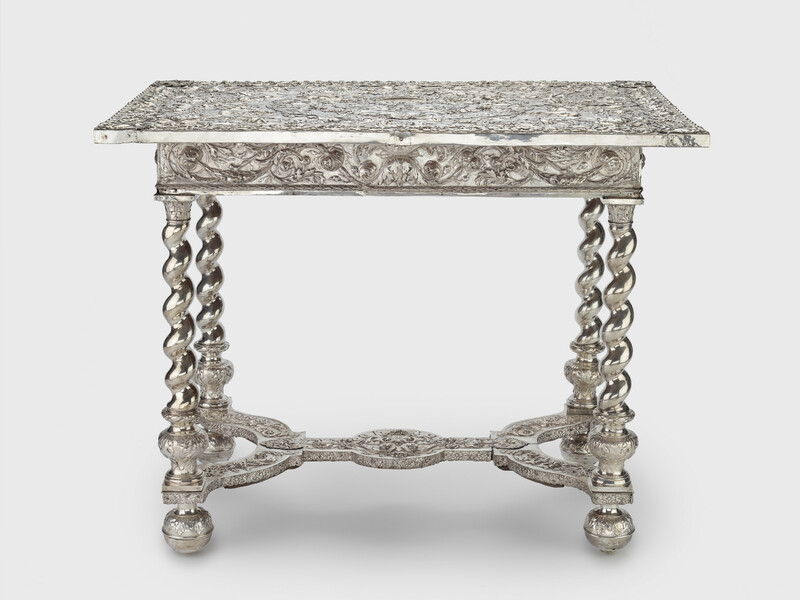 This wooden table is covered with individual silver sheets, which were embossed (repoussé) and chased with the crowned cypher of Charles II, tulips and scrolling acanthus leaves before being pinned in position. The table is thought to have been supplied to Charles II c.1670. Silver furniture was the height of royal fashion in the second half of the seventeenth century, but it is very rare today. Most of the magnificent silver furnishings made for Versailles in the time of Louis XIV were soon melted to pay his armies. The table and stands were made as part of a set completed by a mirror, which would be placed between the windows of an apartment or gallery. At night, light from candleabra placed on stands would be reflected into the room by the mirror.